Gallia Academy senior Ashton Webb (11) goes up for a spike, during the Blue Angels’ straight games victory over Portsmouth on Thursday in Centenary, Ohio. CENTENARY, Ohio — Streaks continued and school history accomplished. 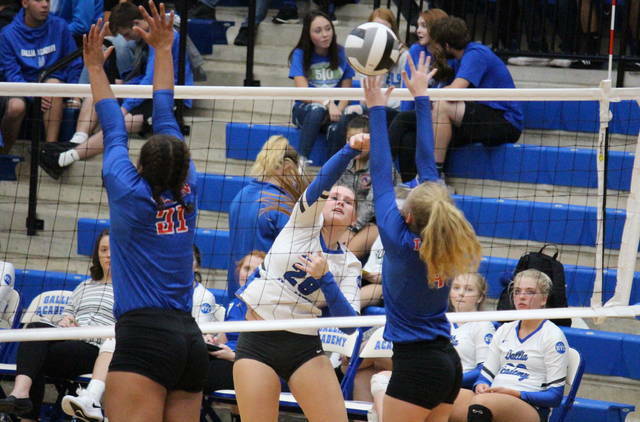 The Gallia Academy volleyball team’s 39th straight Ohio Valley Conference victory came in straight games over guest Portsmouth on Thursday in Gallia County, and in the third game of the match GAHS senior Ashton Webb became the first player in school history to reach the 1,000-kill milestone for a career. The Blue Angels (14-2, 10-0 OVC) — who’ve now won 27 straight home OVC matches — never trailed in any of the three games, scoring the first eight points of the night en route to a 25-10 win in the first. After a 1-1 tie in the second game, the only tie score of the night, GAHS went on a 10-0 run and eventually went on to take a 25-6 victory. Gallia Academy began the third game with four straight points and the Blue Angels took a 13-2 lead on Webb’s 1,000th career kill. The hosts led by as many 16, at 22-6, and ultimately settled for a 25-12 win to seal the match. After the victory, Webb — a verbal commit to Ohio University — gave credit to her teammates for helping her to reach the 1,000-kill milestone. “These girls, I wouldn’t be able to do it without them,” Webb said. “I’ve had so many great passers over the years. These girls this year really helped me get there, I wasn’t even close at the beginning of the year, but their passes and Peri Martin’s sets really helped me get to 1,000 kills. GAHS head coach Janice Rosier noted the impact Webb has had on the Blue Angel program. As a team, GAHS finished with 11 aces and serve percentage of 89.2. Portsmouth had one ace in the match, but a 96.6 serve percentage. 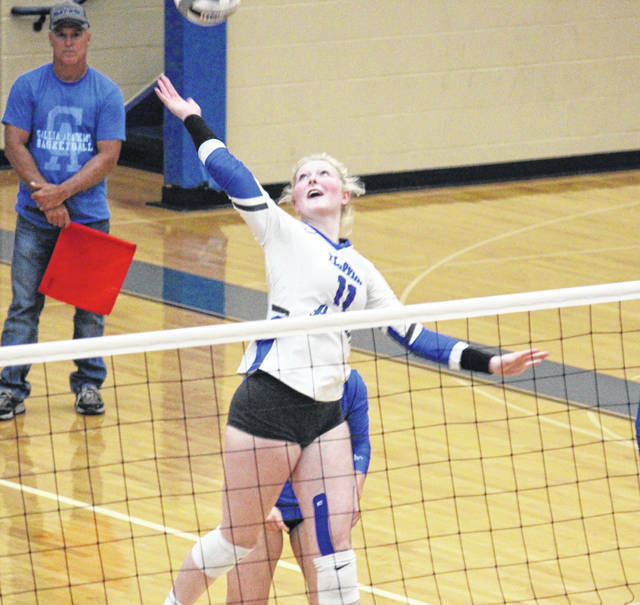 The Blue Angels earned a 53.1 hitting percentage and a 72.4 side-out percentage, while PHS had a 27 side-out percentage and a sub-zero hitting percentage. 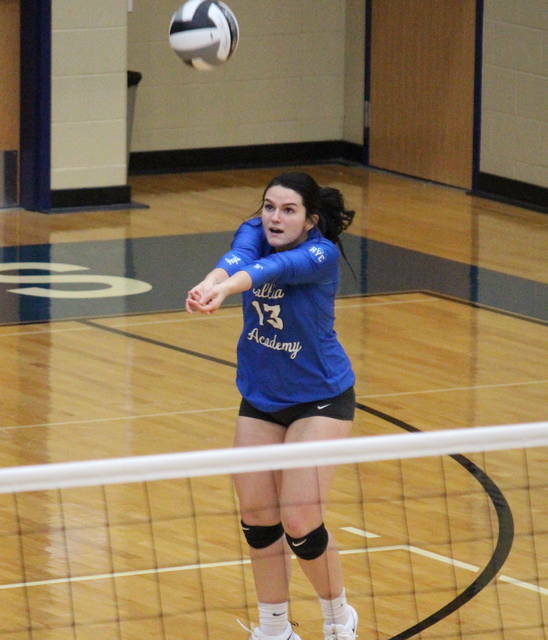 Martin led the Blue Angel service attack with 19 points, including one ace. Alex Barnes was next with 14 points and a trio of aces, followed by Taylor Burnette with 11 points and one ace. Hunter Copley had four points and an ace in the win, while Webb and Maddie Wright both finished with three points, with three and two aces respectively. Webb led the GAHS net play with 26 kills, putting her at 1,002 for her career. Maddy Petro contributed eight kills to the winning cause, Wright added three kills and a match-best two blocks, while Barnes and Martin each finished with a pair of kills. 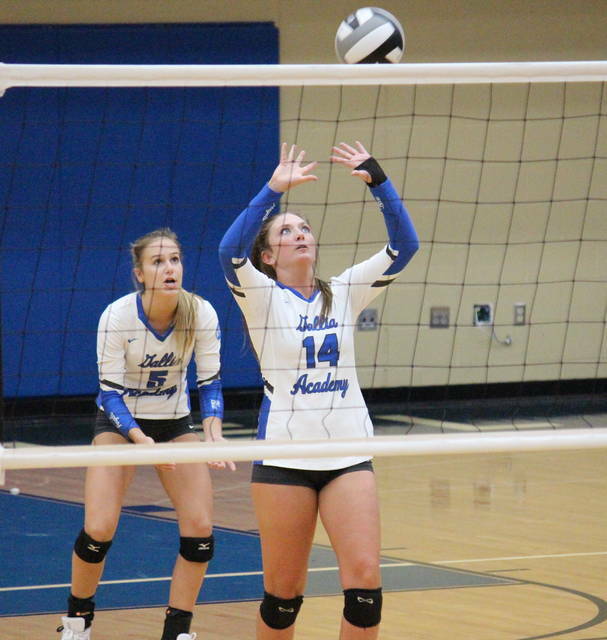 Aubrey Unroe had one block for the Blue and White, Martin earned a team-best 36 assists, while Barnes and Copley each had eight of the team’s 27 digs to lead the defense. Portsmouth — which is the last OVC school to defeat GAHS, doing so on Oct. 12, 2015 in Scioto County —fell to 2-8 in the eight-team conference. The Lady Trojans were led by Jaiden Rickett with four points. Morgan Grashel had three points for PHS, while Katie Davis added one. Gallia Academy had now defeated Portsmouth in six straight meetings, including in consecutive games on Aug. 30 in Scioto County. After a tri-match at Logan Elm on Saturday, GAHS will resume league play on Tuesday at Ironton.